Do you own a brick and mortar business? I talk a lot about how to use Social Media for online marketing, but it can be very powerful for brick and mortar businesses as well! Here are some quick, easy and instantly engage-worthy marketing ideas for your business that isn’t online, but still needs to show up there. Quick, easy and instantly engage-worthy marketing ideas for your brick and mortar business. 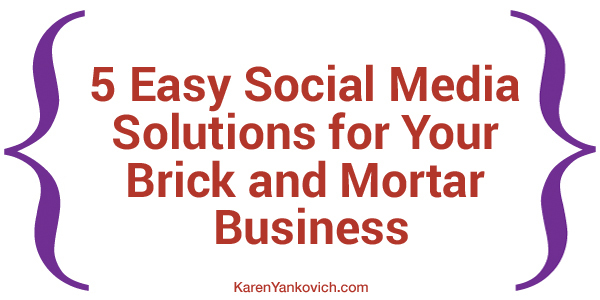 As a brick and mortar business you are probably already on Facebook. Facebook business pages, while declining a bit in popularity due to Facebook algorithm changes, are still popular to get cheap advertising. But for something completely free and fantastic at engaging your clients – incentivize the Facebook checkin. Advertise that any person who walks into your store and checks in on Facebook gets a 10% off coupon, or a half price entree, or a free dessert. The list goes on. Be as creative as you want to be! Because every time someone checks in, it tells a few hundred people that your business rocks. And that is a LOT of social proof for one small step of social media marketing. Make it a part of the job requirement that your staff take a few pictures of today’s specials, sales, or other noteworthy events and send them out over Instagram. Make sure they geo tag them (their location services have to be turned on when they take the picture) when they upload them to your Instagram thread. Are you a deli? Take a picture of the best looking sandwich of the day, geo tag it and send it out. Are you a sit down restaurant? Take a picture of the daily specials board, geo tag it and voila. Hashtags have many purposes and one that is certainly helpful for brick and mortar businesses is the searchability these tags can create by town or location. Tweet out some of your best pictures of the day, you could include food specials, sales, or employee of the month, but make sure to hashtag it with your city or town. Are you a pizzeria? Hashtag those pictures of your wonderful looking (I can almost smell it!) pizza pies with your town name so people know where to find you easily and quickly. These 30 second or less videos can be huge for certain brick and mortar businesses because of how engaging they are for customers. Not to mention that because YouTube is a Google company, after only a few videos your search rankings will climb. Are you a realtor? Whip out your smartphone and take some short videos around town (not to mention short videos of houses for sale). Tell your prospective buyers how awesome your town is! Why would someone want to pick up and move? Show them. Then upload them easily onto your YouTube channel. P.S. This content can also be repurposed on Instagram or Facebook as well. Instagram is made up of hashtags for popularity and searchability. Start searching the hashtags for pictures of your local area, or anything that relates to your business product. Do people share pictures of their favorite homemade pizzas? If so and you run a pizza joint – comment and share the love. Are you a bait and tackle store? Search out hashtags of lakes and rivers near you and comment on all the pictures people post of fish they catch. People LOVE to take pictures of their fish. Are you a camping store? Search out hashtags of people traveling, camping, using their gear etc. Comment away. There are many more ideas where these came from – and I’d be glad to help you generate more! Just join my LinkedIn group, tell me what premise-based business you run and I’ll come up with social media marketing ideas for you to get your wheels turning and and your social media message spinning. I look forward to seeing you there.